Paranormal Activity: The Ghost Dimension, follows a new family, The Fleeges – father Ryan (Chris J. Murray), mother Emily (Brit Shaw) and their young daughter Leila (Ivy George) – Who move into a house and discover a video camera and a box of tapes in the garage. When they look through the camera’s lens, they begin to see the paranormal activity happening around them – including the re-emergence of young Kristi and Katie. There’s nothing like a good ol’ haunting horror movie to watch over Halloween and Paranormal Activity: Ghost Dimension is the perfect flick for your scary viewing at this time of year! To celebrate the release of Paranormal Activity: Ghost Dimension, One Take Kate with thanks to Paramount Pictures is spine-tinglingly excited to have 3 Paranormal Activity: Ghost Dimension in-season double passes to give away! Watch the trailer for Paranormal Activity: Ghost Dimension to find the answer to the competition question. Don’t want to watch the trailer? Name the couple who are haunted in the first ever Paranormal Activity (2007) film? K____ and M____. This competition closed on Friday 23rd October 2015 at 9:00pm. 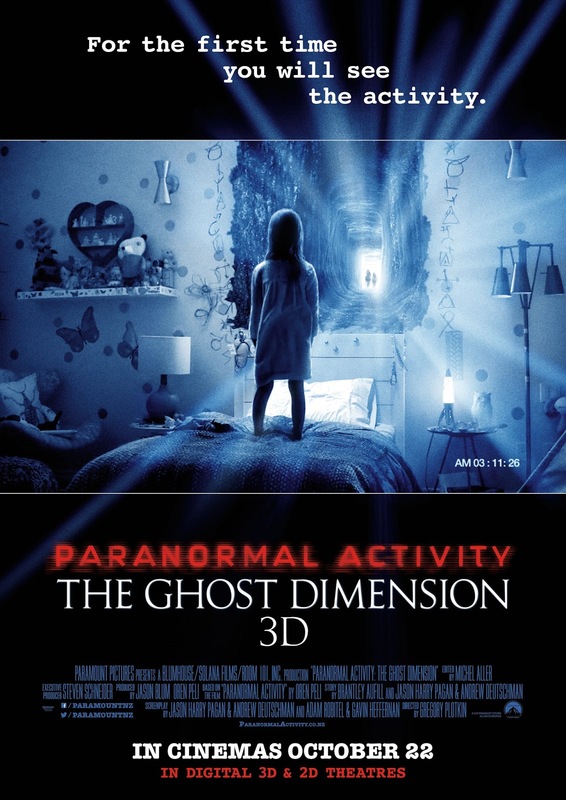 Prize details: 3 lucky One Take Kate fans will get 1 x Paranormal Activity: The Ghost Dimension in-season double pass; thanks to Paramount Pictures. All entrants that have entered via an option on the Rafflecopter Competition form or One Take Kate Facebook Giveaway Tab and have a valid NZ postal address, will be eligible to win. Competition starts on Friday 16th October 2015; with the winner being drawn at random after 9:00pm on Friday 23rd October 2015. Paranormal Activity: The Ghost Dimension in-season double pass will be sent to winners with a valid NZ postal address, as listed via NZ Post.